COLOR(S):Dark red with dark sable markings. 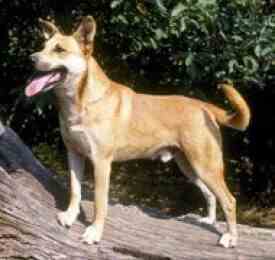 The Carolina Dog is very similar in appearance to a small Dingo. The distinctive features of this breed are those which have been valuable to its survival in the swamps and forests of the South. The Carolina Dog has a medium length straight back, well developed chest and well tucked up belly, giving it a slight resemblance to the sight hound breeds. It has a long neck, wedge shaped head with powerful jaws, almond shaped dark eyes with a soft, intelligent, yet alert expression, and large erect high set ears which are very mobile. The Carolina Dog is very well muscled and powerful for its size, showing strong, free and agile movement with a lot of drive and is very flexible and able to turn instantly. The Carolina Dog is a pariah dog. ("Pariah dog" is a general name in India for the half-reclaimed dogs which swarm in every village, owned by no one in particular, but ready to accompany any individual on a hunting expedition.) The Carolina Dog is one of the very few breeds existing today that is truly a primitive dog, a result of natural selection for survival in nature, and not of selective breeding. Wild specimens are still known, so this is not a completely domesticated canine. This dog that has survived as a free living animal in the swamps, savannahs, and forests of South Carolina and Georgia for thousands of years, has also proven to be highly adaptable and amenable to domestication, and an excellent pet. The coat of the Carolina Dog is easy to groom and practically takes care of itself. It will benefit from an occasional brushing. Bathe only when necessary. No significant health problems for this breed. The Carolina Dog should be taken for a daily, long walk. While on the walk it is very important that the dog is made to heel beside or behind the human while on a leash, as in the dog\'s mind, the leader leads the way.